Last Saturday I was lucky enough to attend the meet up event at Minerva Crafts in Darwen, or as I shall call it, The Marvellous Minerva Meet Up. My weekend started on Friday lunchtime, when I loaded myself and quite a few bags (my husband did ask me how long I was going for!) into the car for the journey up North. It was a long and hot one, I can tell you. Queues of traffic on the M6 meant that instead of taking just under 4 hours, my journey took nearly 5 and a half! I was hot, sticky and tired by the time I got there! I had already arranged to meet Maria and her husband (all the way from Australia!) and Winnie for dinner on the Friday evening, and we were also joined by Karen. As I'd never met any fellow bloggers before, it was lovely to meet just a few initially rather than feeling overwhelmed by meeting everyone at once. I'm quite a shy person in large groups so this was perfect for me. We dined at a little Italian restaurant in Darwen, and were entertained by the waiters singing "Happy Birthday" to as many of the other diners as they could manage. We were asked several times if we were celebrating a special occasion - I think they wanted someone else to sing to! On Saturday morning we made the short drive from our hotel to Minerva Crafts for an exciting day of workshops, presentations, chatting and fabric shopping. Sadly I left my camera behind at the hotel, so what follows are very, very poor photos taken on my phone. I seem to have developed a bad case of camera shake! We were greeted at the door by Vicki, Minerva Crafts Sales Director, and the brains behind the event. Vicki gave us our name badges and information about the day, then we were free to browse. The craft centre is huge, with fabric arranged by colour down one side, yarn down the other, and every kind of crafting tool and notion you could want in the middle section. A warm welcome from Vicki. 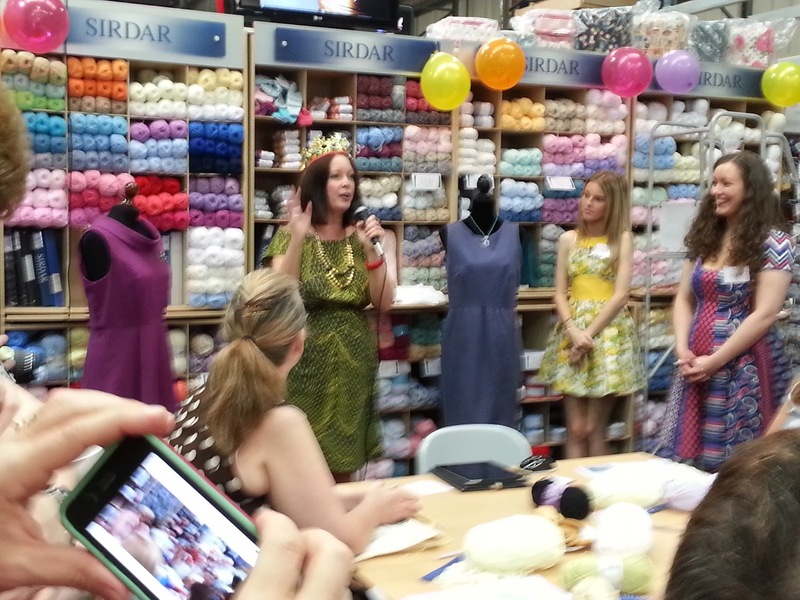 After Vicki welcomed us all, we were treated to a talk by Karen of Did You Make That?, who attempted to find the perfect stitcher amongst us. Apparently none of us were perfect, having confirmed that yes, we do sometimes skip pre-washing fabric, we don't always make a toile, we do sew over pins and worst of all SOMETIMES we use fabric scissors for cutting paper! As you can (almost) see, Karen is wearing a crown, which was to go to whoever was found to be most perfect. I spent some time browsing the fabric selection and then took part in a workshop to create a covered button necklace. It was great fun, although a somewhat messy hour! The necklaces would make great gifts. During the afternoon, the By Hand London girls gave a presentation about their "journey" so far and the joys and challenges of starting and running their own business. Soon after that a group of the Minerva Crafts bloggers (myself included) were invited "behind the scenes" to visit the warehouse. Wow! 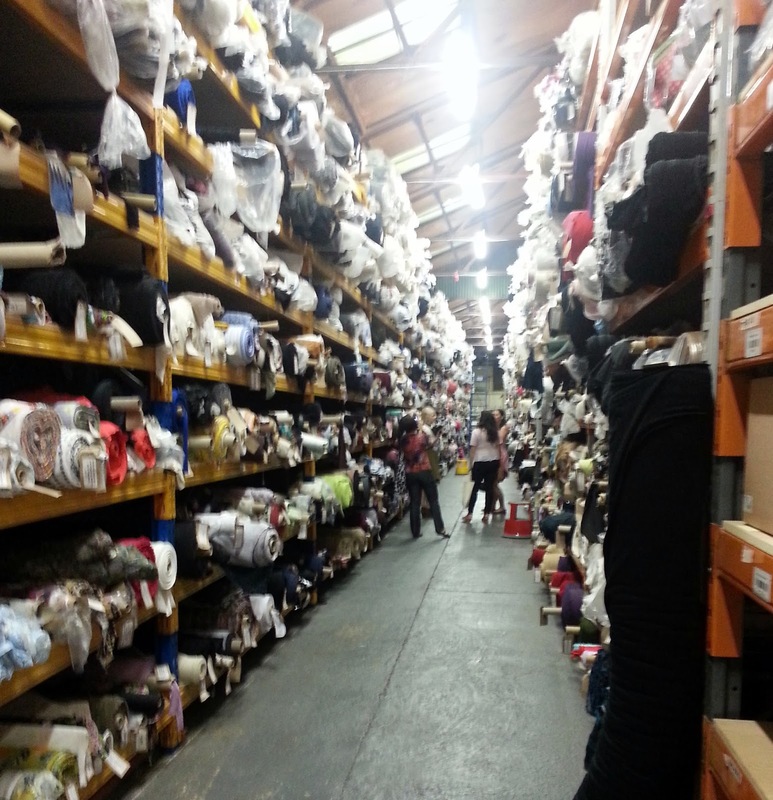 What an amazing place, it was a real Aladdin's cave of fabric. How on earth they know where everything is is beyond me! 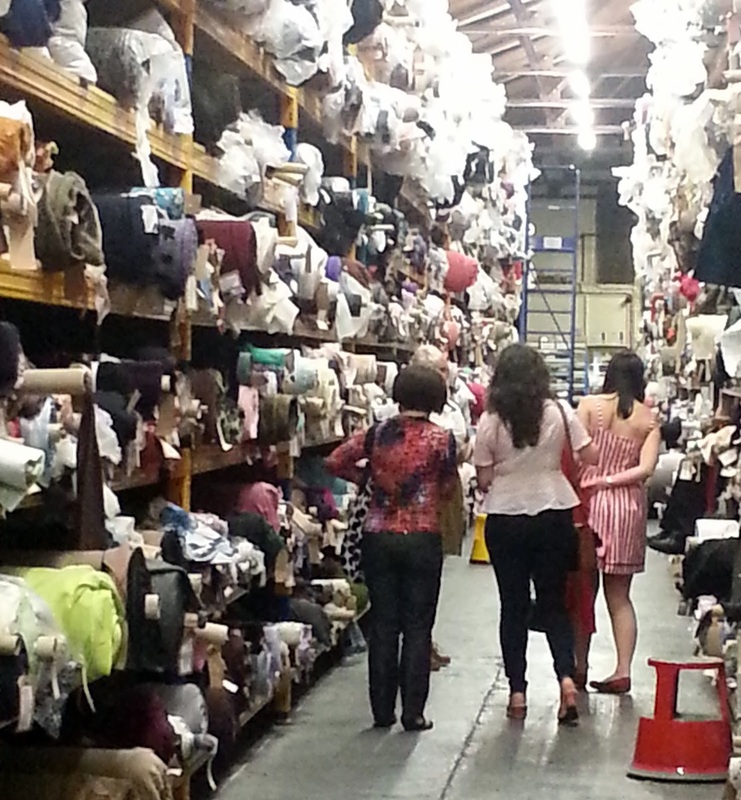 A few very small bloggers surrounded by mountains of fabric. Soon it was time to head back to the hotel to prepare ourselves for the evening event, a dinner hosted by Minerva for their network bloggers. This was held at Blackburn Rovers football club, and was the event we'd all spent the last few weeks making our posh frocks for. 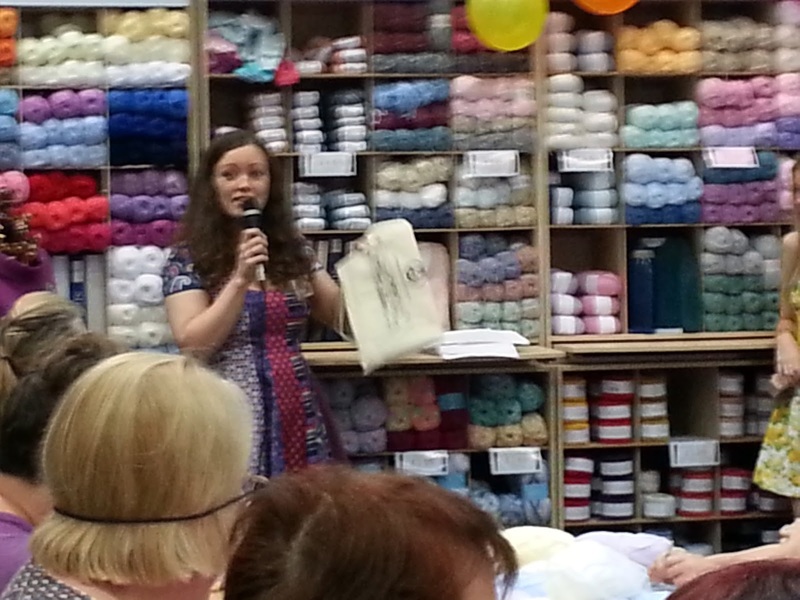 All that remains for me to say is a huge "Thank you" to everyone at Minerva Crafts for an amazing day. I can't imagine the work that must have gone into organising the event, but everyone - staff and members of their craft group who helped out with refreshments all day - was cheerful and helpful to the last. They simply have to run one next year too!!! I loved meeting you and all the others. This day was so successful with over 500 through the door, can you imagine how many will turn up to the next one???? That warehouse looks amazing! Love your necklace. Oh it looks amazing! I'm so sad I missed it and didn't get to meet you. Hopefully another time!